The Case Against Noam Chomsky - Mental Processing The Case Against Noam Chomsky and Mental Processing, volumes one and two of A Biological Philosophy, are about philosophy, cognitive psychology, and linguistics. 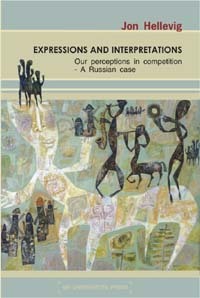 The first volume presents the theory of speech as interpretation of feelings and language as a social practice. In linguistics this distinction has not been made leading to great confusion in the science. The second volume describes how feelings are created in mental processes (complex, high-speed neural processes) as a function of an individual (unconsciously and consciously) interpreting himself in relation to the environment. 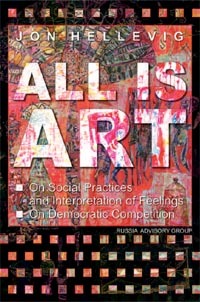 - The first volume is presented as a case against Chomsky in view of Chomsky's theories offering a complete contrast to the ideas of a biological philosophy in all its aspects. 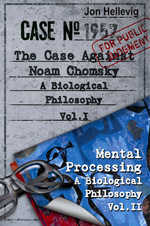 A Case Against Noam Chomsky, A Biological Philosophy Volume 1 BOUND TOGETHER IN ONE COVER WITH Mental Processing, A Biological Philosophy Volume 2.